AdWords lets advertisers show ads on the Display Network (GDN) and while it has ways to target ads to show on specific domains, or to exclude specific domains, they don't have a wildcard placement exclusion feature. So if you want to show your ads on all relevant placements, except those with a Polish domain extension (.pl) or an extension like .org, you would need to monitor automatic placements and add exclusions every time you saw one with this extension. The following script makes it possible to automate excluding placements when the domain includes a particular string. Run this daily or weekly in your AdWords account to prevent accruing too many clicks from unwanted placements. 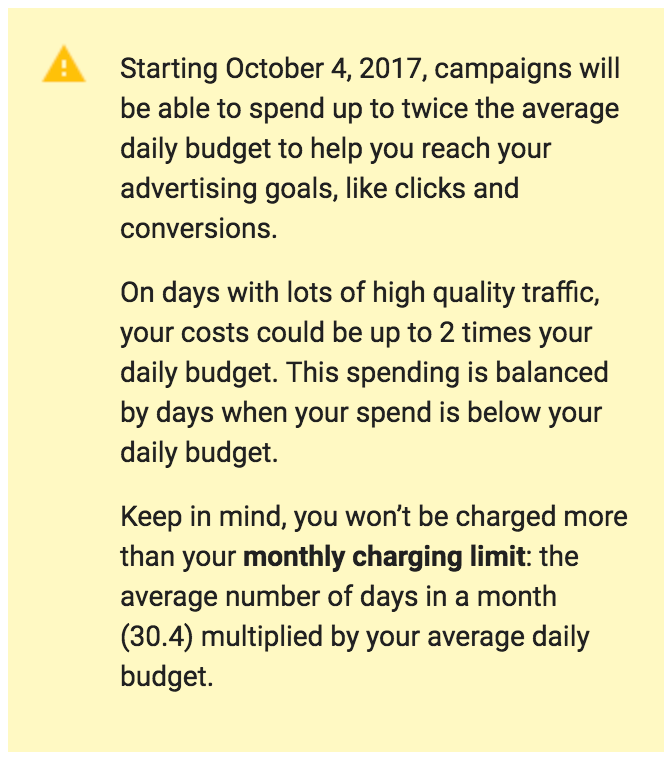 Automated Rules in AdWords are great to set up alerts for when things spend too much without converting enough. But unfortunately these Automated Rules can only be run once per day, so they're not very useful if you want to get notified as soon as a keyword or product group exceeds your thresholds. So here's a simple script that queries for keywords or product groups that have exceeded a specific amount of cost, and have fewer than a specified number of conversions to show for that cost. It then emails the list of alerts to the user. The email can include deep links to AdWords to make it really easy to go and fix issues. If the instructions for the settings currentSetting.customerId, currentSetting.effectiveUserId, and currentSetting.ocid confuse you, check out an earlier post by Russ that explains deep linking to ad groups in AdWords in more detail. 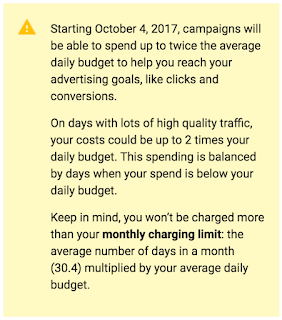 Google announced that daily budgets will now be able to overdeliver up to 100% rather than 20% as had been the case since the earliest days of AdWords. Overdelivery allows Google to help advertisers meet monthly budget targets by making up for slow traffic days by spending more money on high volume days. They assume that advertisers will divide their monthly budget by 30.4, and set this as the daily budget. Then when there may not be a whole lot of traffic on Saturdays and Sundays, Google can exceed the daily budget on Mondays and Tuesdays when there might be more people looking for what the advertiser sells. To truly control budgets they way you need, you'll probably want to use tools, automations, and AdWords Scripts. Here's a very basic script that lets you enforce a more strict overdelivery for a campaign. The script assumes that your daily budgets are the baseline of what you'd like to deliver. Use the setting 'allowedOverdeliveryPercentage' to control a maximum spend for the day by setting a value between 0% and 100%. The script fetches every active campaign's daily budget and accrued cost for the day. If the cost exceeds the daily budget + the allowed percentage of overdelivery, it will label that campaign and pause it. Remember to use another automation to re-enable all paused campaigns during the first hour of every day. You can look for campaigns that have the label set by the script and re-enable those. The script can be run once per hour so you may still exceed the total cost until the next time the script runs. The script doesn't deal with shared budgets. The script doesn't deal with shopping and video campaigns. Making it work for those is really easy, you just have to update the campaigns call to use the video and shopping methods for getting campaigns. If you need more control over budgets, and you don't want to do any coding, consider our prebuilt scripts available as part of an Optmyzr subscription (Optmyzr is my company). The AdWords API is regularly updated by Google with their latest capabilities. While it's great not to have to wait too long to get access to new capabilities, it comes with a downside too: AdWords Scripts may stop working on the day Scripts switch to using a newer version of the API. The reason is that new API version may rename or remove metrics and attributes. An AdWords Script that is not updated with these latest names will stop working. The release date is not always the date that AdWords Scripts start to use the newer version. As a result, it is very tricky to ensure that scripts you write continue to work. Luckily there is a solution and it's as simple as telling your script which API version it should use by including the optional apiVersion argument. By telling the script which API version to use, you guarantee that it will continue to work on the day that Google switches the default the a new version because you now control the switch that tells the script when your code has been updated and should start using a new API version. You'll still need to do the migration at some point, but you'll have several months to do so. The sunset date in the table above indicates the final day that a script can use a particular API version. After that date, the old version will cease to work. Note that you do NOT have to go through every API version. It's completely acceptable to skip a version if you don't need any of its capabilities. For example, say you were using v201609. Since it doesn't sunset until October 2, 2017, you could have waited for the release of v201708 on August 9, 2017, and skipped the 2 API versions in between.